Empire Calls offers Online Mobile Recharge Software for Multi Recharge Services. Our Mobile Recharge Software includes Online Website access and Mobile Recharge App which is available for Android users on the Google Play store. One of the best Mobile Recharge Softwares, Empire Calls App lets the retailer recharge multi-operator prepaid mobile recharge for its customers. You can start your own recharge business by simply downloading the app and filling your wallet with as low as Rs.1000. Or you can contact your Empire Calls distributor. 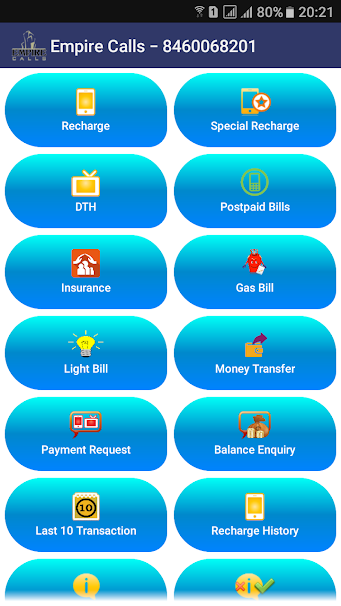 Currently the services available on the app are Online Prepaid Mobile Recharge, DTH Recharge, Data Card Recharge, Postpaid Bill Payment, Electricity Bill Payment, Insurance Bills, Gas Bills and Money Transfer. Online prepaid recharge, DTH Recharge and Data Card Recharge available on our Mobile Recharge App for all Prepaid Operators namely Airtel, Aircel, BSNL, MTNL, Idea, MTS, Reliance GSM, Reliance CDMA, Tata Docomo GSM, Tata Docomo CDMA, Tata Indicom, T24, Uninor, Videocon, Vodafone, Virgin CDMA, Virgin GSM and all DTH Recharge operators namely Airtel DTH, Videocon D2H, Dish TV, Tata Sky, Big TV, Sun Direct. The Empire Calls Recharge API software is easy to use, simple and fast. Download Empire Calls App for android from Goole Play Store. Airtel, Aircel, BSNL, Idea, Loop, Reliance GSM, Reliance CDMA, Tata Indicom, Tata Docomo, Virgin Mobile, Videocon, Vodafone, Uninor & MTS. Tata Sky, Dish TV, Videocon D2h, Sun Direct, Big TV, Airtel Digital TV. Recharge facility is available 24x7.